In about 15 minutes from Panagsama, we reached Hale Manna taking the roads towards Sitio Bas Dako. Upon arriving I was immediately fascinated by the vicinity: the vastness of the place was like a secret garden that amazed and charmed my sight. A little bit farther, the breeze that came from the rushing waves of the sea soothed my inner soul. The tropical surroundings delighted my being for I was, once again, with nature. As I continued my fascination with the Hale Manna Resort, I wondered about the meaning of Hale Manna because the sound of the name was intriguing, and this was what I found out. At the door of the resort was an inscription of the meaning of the place, to quote. Wow, HALE MANNA is truly magical not only in its meaning but more in its area and location! Indeed it’s really a perfect setting for those who want to have fun, to have adventure, to relax and to unwind. It’s a quiet, quaint and perfect place for a vacation or for an unforgettable escape. I was glad I joined the scuba diving. There were six of us, Kuya Val and his father, Ate Jown, Kuya Rain, Ate Jai and I. After drinking a lot of water we finally stepped on the seawater, and then sank ourselves deeper and deeper. We stayed at the level of 30-40 ft. The coastal garden of Hale Manna had been beautifully engineered by nature.There were a lot of healthy corals flaunting their majestic structural designs. Their majesty was beyond compare. The diving sites I had gone to before could never compare with the beauty of this place. 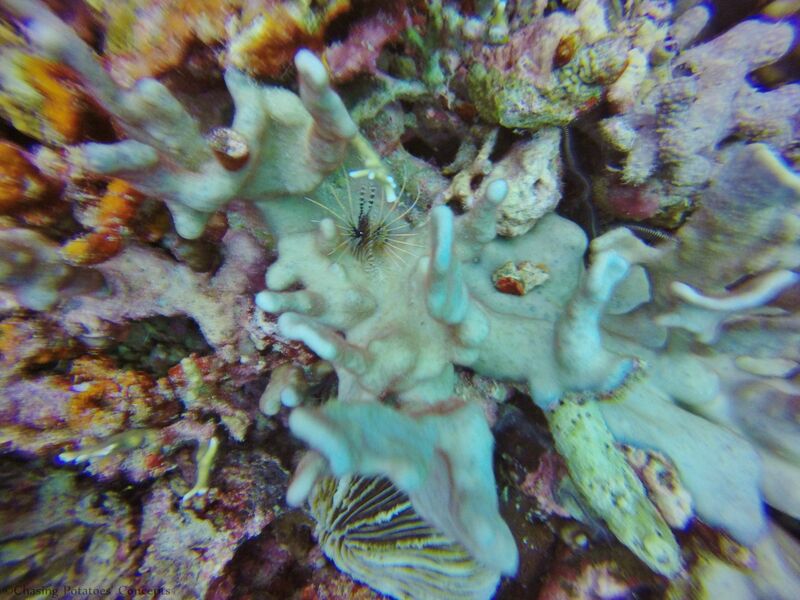 The coral reefs here in Hale Manna are really healthy that’s why they blossom abundantly. The sea creatures seem to exude joy as they actively move about in their habitat. 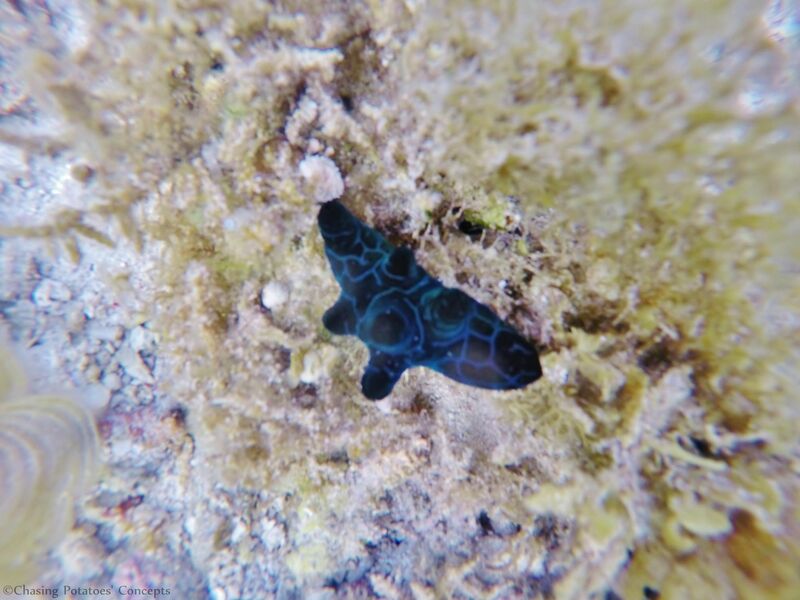 And witnessing these enjoyable marine creatures in their vibrant environment, divers like me feel extremely awed. The turtle is like an alien spaceship flying gracefully and it didn’t even give any attention to us. It just kept on swimming and swimming until it disappeared from view. And when everyone finally ascended to the surface, the sun had reached its end for the day. Till we see each other again, Mr. SUN. At the time when the sun had started to rise again, I just couldn’t let go of the opportunity of swimming again in the sea. This time I was just snorkeling. Yes, AteJai and I snorkeled at the same location where we dived, but this was totally a different experience. The fishes,through observation , were having their meal. It was their feeding time. A variety of big and small fishes were actively searching for food. The sight was really beautiful because so many fishy beings appeared showing off their beauty. Then whooops, the turtle also checked us out. Then I shouted to Ate Jai that there was the resident turtle of Hale Manna. Then due to my noise, the turtle swam away. Oh…well. Hale Manna just not-so-recently finished its wide swimming pool and it was to be blessed by Fr. Tito on that day. After the blessing, all of us went into the pool. Hooray! The pool is more than beautiful. It is surrounded by trees and various ornamental plants. The ambiance feels like you are in the middle of a forest swimming in a bluish lake. In the pool, there stood artificial giant mushrooms where water flowed and drizzled like rain drops.Even if we were just wading or “crawling” in the 3 ft. deep water, we enjoyed ourselves. The other side of the pool had two slides and 5 ft. level of water but the construction was still going on. Nevertheless we still enjoyed staying in the 3 ft. deep water. I bet if the construction and the finishing touches were all done, there would be lots and lots of fun. My amazement and surprise at the beauty of Hale Manna Coastal Garden are beyond words. I am still clinging to the idea of having another experience in the place. Truly, it’s a gift from heaven. So, I really recommend Hale Manna for those who wants to go away from the hustle and bustle of the city life. There, you’ll find peace and an awesome increase in positive energy. My only TIP : Please don’t ever forget your scuba diving or snorkeling gears. To contact Hale Manna, visit their website or Facebook page in these links. Thanks Aye Louise for taking time to read and appreciating my photos. Yes, you can! Just try Discovery Scuba Diving, diving without license, if you want to learn scuba diving. How amazing are these photos?! I love the underwater shots. Everything is so beautiful under there! Wow scuba diving looks amazing. The starfish! So cute. How many swimmers did you pack haha. Hi Miranda 🙂 HAHAHA! Me too. I’m really scared of barracuda especially if it’s a lone barracuda. It has a tendency to attack if threatened. Magical place and photographs! Love them all! I love snorkelling! What a beautiful place! The coral reef is definitely healthy! And it looks like there’s a wall; Sheila likes scuba diving along walls as she doesn’t have to worry about stepping on corals. Hehe! Actually, this was my first time to to swim and dive witnessing these beautiful and healthy coral reefs. I wish all Philippine seas were like this. hehe! 😀 Anyway, thanks idol for stopping by. Seems A LOT of fun, especially the scuba diving part. The part about the fat human being is so hilarious! But I don’t think you are fat at all! Glad you had a great trip. Thanks too 🙂 Have a great day.